A Charlie Brown Christmas, based on Schulz's Peanuts comic strip, has also become a Christmas tradition! Decorating the tree, mailing a letter to Santa, watching “It’s a Wonderful Life,” Christmas pageants and Nativity plays galore, baking and decorating cookies, singing Christmas carols by the fire, reading “The Night Before Christmas”; these are all Christmas traditions that have evolved. Probably the most universal Christmas tradition that has been around for centuries is that of singing Christmas carols. Carols are the musical form by which Christmas is best known. Derived from the French word, carole, or kind of circular dance or joyous song, carols used to be written and sung during all four seasons - autumn carols, summer carols, and so on. They were popular, typically being sung at weddings, birthdays, and other joyous occasions. However, only the tradition of singing them at Christmas has survived today. Carols are folk-like in character, simple, popular, have a religious influence, and are seasonal. The term carol has become a catch-all term for a variety of musical forms spanning many centuries. 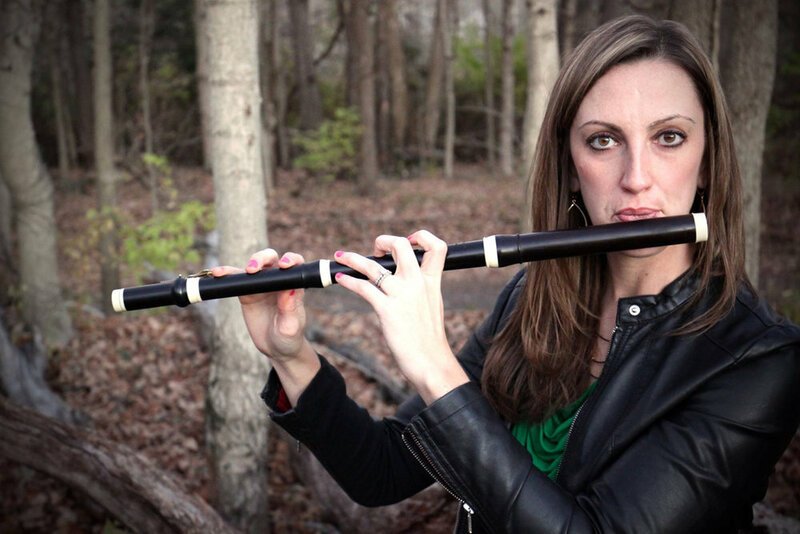 For centuries, the Christian church and liturgy drove musical development. Hymns, which are believed to have been introduced to the Western Church in the fourth century by St. Ambrose, were allocated to specific services and seasons. They were the only verse forms within the official liturgy that were set to simple tunes that made them particularly memorable. As the Church encroached upon everyday affairs of its members, including music, members showed their displeasure with this by writing secular songs, often with texts about love, drinking, and even secular parodies of liturgical texts! Carols became a means of expression for everyday people to express their freedom from the church with the use of the vernacular. St. Ambrose (b.340 AD) is one of the four original doctors of the Church. He's credited with developing antiphonal (or call and response) chant, as well as the famous 'Te Deum' ("We praise thee, O God...") text. Panel from the Ghent Altarpiece (15th cent.) shows angels singing. Or suffering from migraines. Maybe both. Few vernacular carols were known before the fourteenth century because Latin was primarily in use and not a language that the ordinary person could understand. 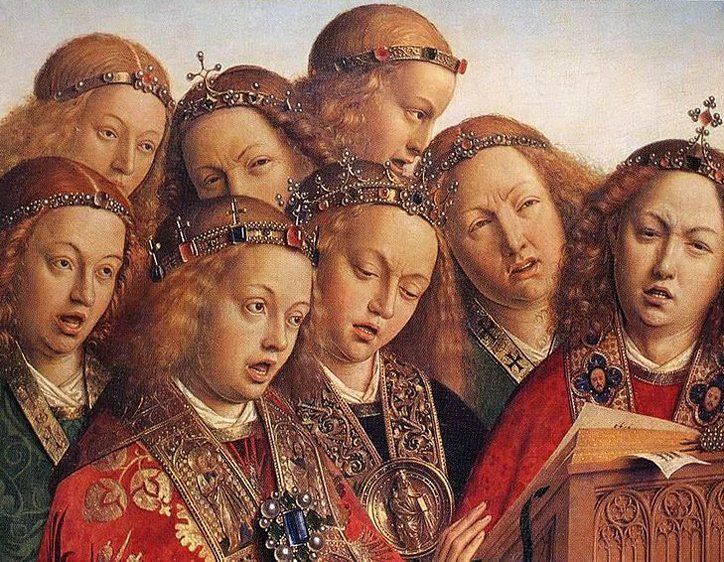 By the fourteenth century songs with vernacular texts became more frequent, laying the groundwork for the development of carols as we know them today. By the fifteenth century, carols were loosely based on the Christmas story and used as a means of entertainment at home rather than religious songs in churches. In sixteenth-century Germany, there was a strong tradition of vernacular song long before Martin Luther’s break with Rome. He and his colleagues firmly believed in the power of music. They adapted the existing repertory, paired sacred texts with folk melodies, and encouraged the creation of new hymns. Meanwhile, in England carols fell out of favor as the Puritans came to power, resulting in the halting of Christmas celebrations and the singing of carols. However, carols lived on as people still sang them in secret. For a long time after the Reformation, the English Church was less enthusiastic about Christmas than the Lutherans. It was the common folk that kept the carol alive throughout the seventeenth century, against the disapproval of the upper classes and the Protestant churches. When the Pilgrims arrived at Plymouth Rock in 1620, they avoided observances of Christmas Day and treated it like any other ordinary day. The English eventually began celebrating Christmas again, and people set ballad-like Christmas texts to popular tunes of the time. These ballads appeared in the colonies along with native folk hymns. These early hymns were crude in form but readily understood by the people. From 1644 to 1660 Christmas Day had been abolished by Parliament and a similar ban was in place in Massachusetts until 1681. It was in secular society where Christmas continued to thrive, and where accounts of Christmas songs survive from plays and music found in homes. 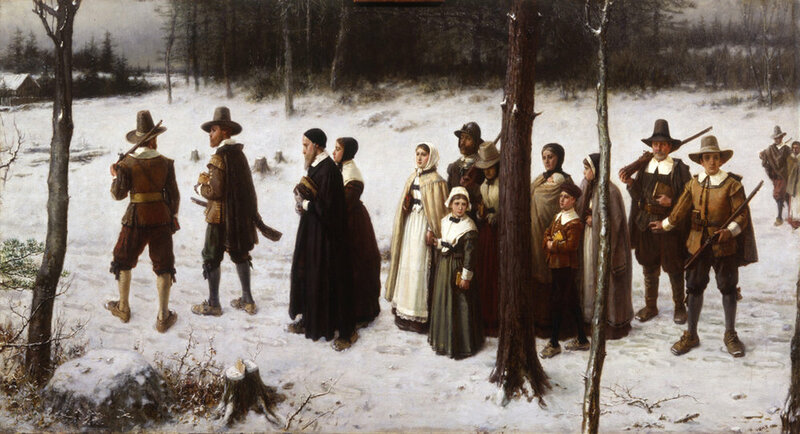 Pilgrims Going to Church is a painting by George Boughton (1833-1905). Note the absence of Christmas trees, snowmen, and Rudolph. From the late seventeenth century to the early eighteenth century, churchgoers in the American colonies sang hymns with texts by the English poet Isaac Watts (1657-1748). Watts wrote the poem “Joy to the World” during this time, but it would be another 120 years before the music we know and sing today was composed by Lowell Mason (1792-1872). It was common practice to set poems to common tunes that were in the same meter, so "Joy to the World” could have been sung many different ways. This period marked a decline for the traditional carol in England, though the old carol tradition vigorously poured into the new genre of the congregational hymn. 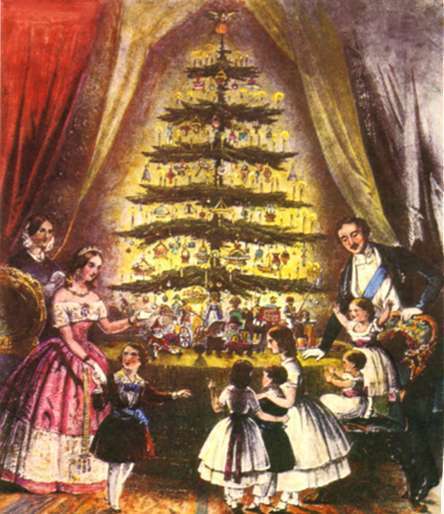 Queen Victoria popularized a number of Christmas traditions, including the German custom of decorating a fir tree, thanks to the invention of the magazine and this engraving found in Illustrated London News (1848). In the nineteenth century, the status of the carol remained a bit stagnant, with the effects of the Puritan era still being felt. However, England produced two important collections of carols. The first of these, published in 1822, is a compilation of carols by Davies Gilbert titled Some Ancient Christmas Carols. Then in 1833, William Sandys published a collection of English carols called Christmas Carols, Ancient and Modern. These publications revived interest in the English carol, or perhaps it was the people’s interest in carols that resulted in these publications. Either way, these publications addressed the unfulfilled needs of the public for the resurrection of carols. Carols grew in popularity by 1843 when Charles Dickens’ A Christmas Carol was acted out on the theater stage, including the singing of Christmas carols. Later that same year the very first Christmas card was produced in England. As the nineteenth century came to a close, people began to again celebrate Christmas, and the carol reclaimed its rightful place in the hearts of English speaking people everywhere. The city of Chicago hosts mass caroling at Cloud Gate ("The Bean") every December. The twentieth century brought about new developments that increased the popularity of carols. With the phonograph and later radio and television, the demand for Christmas carols and songs increased exponentially. Popular singers recorded favorite carols for commercial use at the same time that there was an increase in sales in sheet music and audio recordings. These technologies ensured the preservation and legacy of the Christmas carol. However, credit goes largely to the composers and carol collectors from the fourteenth to nineteenth centuries because they were the first ones to preserve the modern carol, either through the oral tradition or by publication.